On November 22nd, 1884 the mayor of Philadelphia received a letter from the mayor of New Orleans requesting the loan of the Liberty Bell, for the duration of the World's Industrial and Cotton Centennial Exposition. This letter, along with the mayor's positive reply, was submitted to the Philadelphia Councils of Municipality on December 4th. In a gesture of goodwill and solidarity, permission was officially granted to loan the venerable old bell to New Orleans on December 23rd. 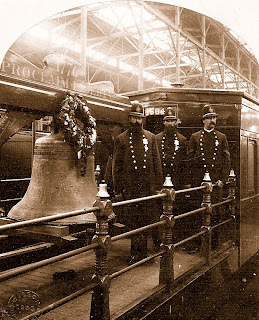 A specially designed railroad car, furnished by the Pennsylvania Railroad Company, was to be used to transport the 2,080-pound bell to New Orleans, accompanied by three police officers of the City of Philadelphia. 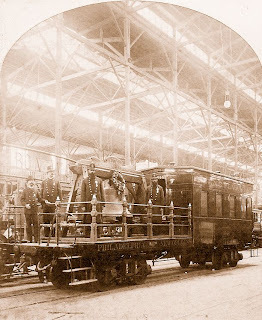 The railroad car consisted of an enclosed section, for the police escorts, and a railed open-platform where the Liberty Bell would be displayed. 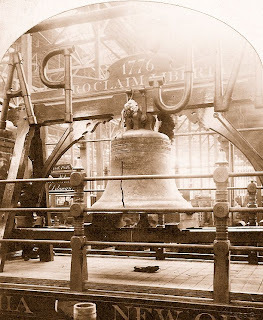 On the morning of Friday, January 23rd, 1885 the bell was removed from Independence Hall and transported to the train which would take the bell on its long journey south. The bell was greeted in eleven cities along the route, and arrived in New Orleans on Monday, January 26th. The Liberty Bell was received with great pomp and ceremony before being transported to the exposition grounds, where it was placed inside of the 33-acre Main Building, in the northern portion of Machinery Hall. 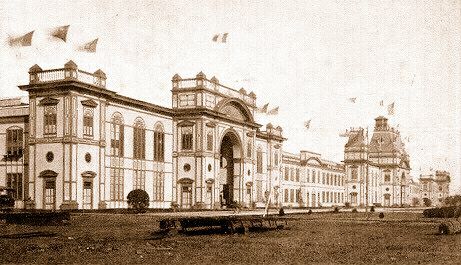 Under the watchful eyes of the police escorts, the famous old bell was viewed by thousands of exposition visitors during the four months it remained at the fair. Numerous Liberty Bell souvenirs were available for sale, among them an illustrated booklet explaining the bell's history and a three-inch high wood-handled brass Liberty Bell with the inscription: "Proclaim Liberty Throughout All The Land 1776 - 1885". 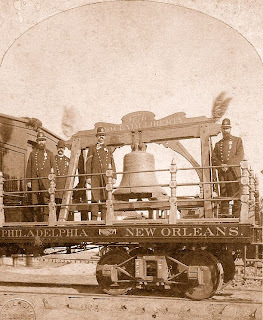 After a highly successful showing at New Orleans, the bell began its return journey to Philadelphia on June 13th, 1885. Accompanied by the mayor of New Orleans and several city officials, who were joined by additional city officials in Baltimore, the entourage arrived in Philadelphia, after a three-day journey. Philadelphia's generous loan of the Liberty Bell to New Orleans marked the first time the revered bell had ever been removed from Independence Hall. Ultimately, the visit of the Liberty Bell to New Orleans helped to heal many of the emotional scars remaining from the Civil War. My great, great grandfather, John Patton, was one of the police officers who was with the Liberty Bell during this time. That's great to know! Can you identify which man he is in the photo? Only three Philadelphia police officers were assigned to protect the Liberty Bell during its journey to New Orleans, and all three men are pictured with the bell. In the pictures of the 3 officers he is standing closest to the Liberty Bell. I have more info on John Patton if you're interested. Contact me at peace4me521@yahoo.com. Sorry for the delay in responding.